I announce last week that ROY SAKUMA will be joining us and teaching one of his exclusive workshops, which are so popular in Waikiki and now can be sampled right here in New York. I said last week that this workshop would be offered on Saturday, but when we tried to adjust the schedule to make it happen, this choice was not an option. Roy’s workshop has been scheduled to take place on Friday, May 31 between 4PM and 6PM. Whether you are a beginner of an astute ukulele player, this will be the place to be on Friday, May 31. This has been a week of meetings and planning to help to put this event together. Maybe you heard us on the radio. Our media person, Maria Coder, has been promoting us through a variety of channels. You might have seen one of the posters or flyers that are being distributed between now and the Fest. Or one of our performers may have contacted you to check this website. However you got here, welcome! You have found your ukulele family. We love new blood. Bring us your latest song, show us your favorite uke arrangement and join us at the 2013 Fest. You will not be sorry. On a practical note, we are at the end of our hotel discount period. If you would like to stay at the Park Savoy, which is the official hotel of the Fest and the place where the midnight jams take place, you need to contact Vesna now! (parksavoy@aol.com or 212 245-5755). We will continue to have additions to the Fest lineup and schedule right up to Fest time, so please keep in touch. See you soon. BTW, WE STILL NEED VOLUNTEERS! The man who has taught more people to play ukulele than anyone else will be leading a workshop on Saturday June 1 at the NY Uke Fest! Four decades ago, Roy started the original ukulele festival in Waikiki. Every year since, hundreds of young people have been introduced to the ukulele at this Festival, which continues to this day and is stronger than ever. Our very own Randy Shimanuki, who played last year at the Fest, was one of the people that started playing through Roy. We are altering our entire workshop schedule to take advantage of this distinct opportunity to present Roy in NY. This is exciting enough, but Roy is also going to do a short set at the Friday evening concert. We are grateful to Andy Wang and Halawai for facilitating Roy’s appearance. Roy, through his love of the instrument and his Aloha spirit, may serve as a catalyst for an evolved Festival here in NY with new dimensions. If so, it is a testament to the influence that one man can have. Other developments have take place this week and others are in the works. All of us are doing our best to arrange another great Fest for 2013. We are aiming to have the website updated and fairly complete by May 1. Please be patient and look at our site to get details. Tickets are available on the website and there is also a button to donate to our Fund for Youth. Quite a few Fest attendees made contributions in this way in years past. We attended the fundraising benefit in Brooklyn this week for Katie Down’s Songwriting Program for South Africa, which will be one or the programs we sponsor this year. At the fundraiser, I saw a great performance by the Ukuladies, who will also be playing at this year’s Fest! It is going to be a memorable event. We hope you can make it this year! Today is Tax Day, but it was also supposed to end the Early Bird period for Fest tickets. Unfortunately, I was not able to get my taxes done by this deadline, so I had to file for an extension. Inspired by this turn of events, we decided to give the Early Bird period an extension too. We will continue to sell the Early Bird full festival ticket until April 23rd. At that time we will announce the full performance lineup and schedule. Apologies to those who asked about the day passes and how much they will be as compared to the full festival Early Bird pass. Quite simply, there is no comparison! We think of the Fest as composed of 6 segments (1-Thursday night, 2-Friday afternoon, 3-Friday night concert, 4-Saturday afternoon, 5-Saturday night concert, 6-Sunday luau.) The at-the-door, box office price for each segment is $45, so that totals $270 and the Early Bird pass is half this (when Paypal gets it right!) Next week, when we announce the full schedule, the online price will still be discounted from the box office price, but not as steeply as this current Early Bird ticket. If you intend to attend anything more than one day, it would probably make sense to get the Full Festival pass. We have had some great developments including the glorious return of Music Guy Mike to the NY Uke Fest. As many of you know, Mike is an extremely knowledgeable ukulele vendor, who is determined to please his ukulele customers with high quality goods and ongoing support. MGM is now affiliated with Hawaiian Music Supply and promises to bring their best ukuleles to offer to us here in NYC. We also plan to announce this as the year of young ones. As we do each year, we include a public service as part of our regime. So this year, we are aiming to put ukuleles in the hands of as many kids as we can. We have a couple of outlets for this initiative. Katie Down has been raising funds for her South African teaching program and we have spoken to others, who work regularly with young uke players. With your help and the help of a couple of uke makers, we will do what we can to help. Any ideas or work time would be welcome. More about this later. 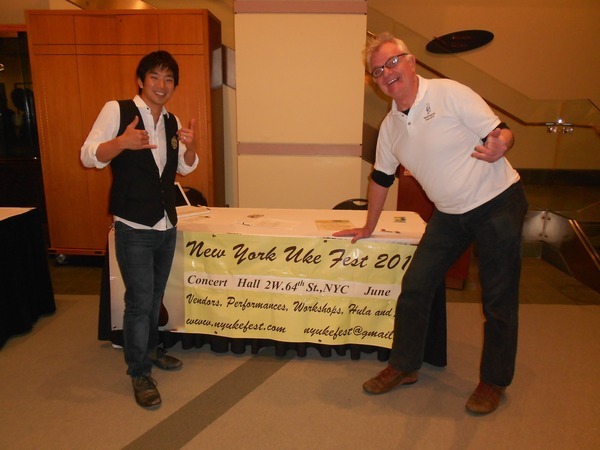 Spring is alive and well in NYC, so we know the Uke Fest is upon us! It has been a tradition with us to sell Early Bird Full Festival Passes as soon as we announce our dates. People who know us well are willing to pay for these tickets with the confidence that it will be another great ukulele event. This early commitment helps us with seed money to cover deposits for the venue, performers and to make other arrangements. We want to thank those of you who have already purchased these tickets. We don’t announce the whole lineup at this stage, but we have revealed the headliners for Friday and Saturday night’s concert. In case you missed it: SMALL WORLD PROJECT will headline Friday Night and RAIATEA HELM will headline Saturday Night! As always, we will have a full lineup of performers to complement the headliners, spanning the local, national and international pool of ukulele players. We are determined to keep this a prime ukulele event. More info will be available soon. The Early Bird tickets will be available until about April 15. When we announce the full range of tickets and a more complete lineup, this steep discount will no longer be an option. Yes, $135 is a hefty price, but it includes the Ahmed movie premier and concert night on Thursday, afternoon workshops and concert on Friday night, all-day events starting at Noon on Saturday with workshops, vendors and networking through the concert from 7:30 until Midnight,, and finally an all-day luau on Sunday, which includes brunch in Central Park and a full meal with beer, wine, soda, water, etc. along with open mics, hula, jams and vendoring. We hope you can join us. P.S. We are in need of volunteers to help with every aspect of the event from promotion through event arrangements. Please help! Greetings for 2013! The music you hear playing in the background is my version of the Hawaiian Wedding Song. I learned the song, so I could play it to my new wife, Junko, at our wedding, which took place on March 18, just a couple of weeks ago. If things seem even more hectic with arrangements for the Fest, please forgive me and imagine how preoccupied my mind has been. Fortunately, we have a great staff of people, who have led me through necessary steps and some extremely knowledgeable and competent performers, who are already promoting their appearance. Let me get right to this topic. Raiatea Helm is coming to our Fest! I first met Raiatea through another friend of ours, at Bill Tapia’s 100th birthday party in Honolulu. So many years ago when I heard her soaring voice accompanied by her uke, I made a wish that we could have her perform in New York. Well now it has happened. Raiatea Helm will headline on Saturday, June 1! Our headliner for Friday, May 31, will be our old friends, Small World Project. Sebastien Dufour and SWP will come down from Montreal for their return to the Fest stage. I can’t tell you how many of our regular Fest-goers have told me that SWP is their all-time favorite act from those we have presented! All I can promise you is that you will not be disappointed. In addition to their headlining concert on Friday, they will also be staging a film event on Thursday, May 30, to open the Fest. The silent film, The Adventures of Ahmed, is the animated vehicle that SWP wrote the musical soundtrack for. We will offer the US premier of this with the live performance by SWP, which will accompany the film. Some other highlights from the lineup…Jim and Liz Beloff, Victoria Vox along with Nico’o from the South of France, all pillars of strength in the ukulele world, will appear at the 2013 event. Sakai, who will grace Carnegie Hall’s stage in the same season, will regale us with his deft work. And Hironobu Saito will appear for the first time. The hula halau will be onstage with at least twenty colorful dancers, there will be open mic opportunities, more ukulele workshops in one place than anywhere else (32 by our current count!) an all-day Sunday luau that will begin in Central Park and continue with a feast back in Ethical Culture. The location that New York City has given us for the park segment is a huge upgrade from the spot they assigned us to last year. We managed to have a great time last year anyway, but a spot that is closer, self-contained and atmospheric should add to the occasion. Let’s hope for good weather. Vendors, Vendors Vendors! will be present! We invite you to purchase the Early Bird ticket, which is the bargain of the decade, since it includes everything we do for the four days, including the movie premier, choice of any workshop, Friday and Saturday concerts, as well as food and drink at the luau. We are still preparing some evolutions and surprises. And the lineup will expand. It promises to be a memorable event! I hope you all had a calm, restful weekend, because next weekend you are going to need all your energy! Get ready for ukulele mayhem! The ball starts rolling this Thursday at 7:30pm with our viewing of the documentary, Under the Boardwalk. This will be held at a great venue-the Church For All Nations, a perfect place for the ukulele, which seems to be booming in all nations. After the film, we will have a Q and A with Nina Koocher, the filmmaker. We’ll have entertainment from Steven Strauss and others, the hula halau will dance and there will also be an open mic, a la Santa Cruz Ukulele Club, the subject of the documentary film. Sound Check! We were at the Concert Hall at Ethical Culture Society on Saturday and we did our sound check. To the humble ears of the four of us present, we were amazed! The acoustics of this space are already vibrant, but the sound system that we will supplement with is very natural, warm and effective. It is going to be exciting to see (and hear) our lineup of acts on this stage. Bliss Blood is coming! Bliss had a gap in her very busy touring schedule, so we were able to satisfy a long-held desire to invite her to play at the Fest. She continues to tour with the Moonlighters but will be appearing at the Fest with Al Street, whom she regularly performs with. I found out how well-known Bliss is the last time I was in Japan. I was wearing a tee shirt with “Brooklyn” on it and one of the Sweet Hollywaiians pointing to my tee shirt asked me if I knew Bliss Blood! (“Bris Brod, Bris Brod, you know?”) So Bliss and Al will be with us on Saturday. Exhibition times are pretty well set now. Sponsors, vendors and others will have tables on display on Friday from 4-10pm, Saturday from Noon until 10pm and Sunday from 2pm-9pm. Next Sunday, we are hoping the weather cooperates and allows us to have our brunch inside Central Park, just across the road from Tavern on the Green (W65th St) If there is any change due to weather, we will announce it here on the website so if in doubt, please check. We are expecting a great day and we have received all the permits, including a sound permit to allow mics and instrument amplification. Tea and coffee, some spontaneous hula, rich ukulele music-a great brunch to start our final day. Some pot-luck additions would still be welcome, so if you have the urge to bring something to share, let’s keep that tradition alive too. Don’t ruin you appetite though, because we are going back over to Ethical Culture for the luau feast and lots more music and dance. We go until 10PM on Sunday.